BEFORE: The reason I’ve entered your 21 day challenge is because after going through a long battle of depression and bad eating habits I realized the best way for me to cope has been to work out and gradually change those bad habits. 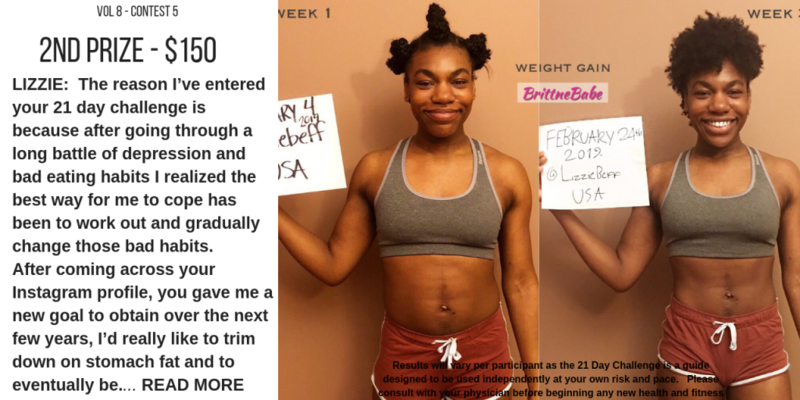 After coming across your Instagram profile, you gave me a new goal to obtain over the next few years, I’d really like to trim down on stomach fat and to eventually be completely toned and just healthier in general. When I saw the results of the last 21 day challenge contestants, I knew that with your help and guidance I could be so much closer to my goal! It kept me motivated, and despite this challenge being very difficult for me, I managed to stick it through with Brittne’s guidance! I’m glad I did, I see and most importantly feel a great change in my life, and will continue to do more challenges later!